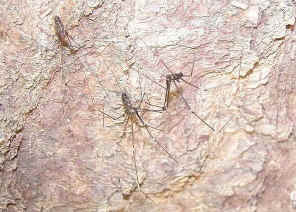 They are small spiders with very long, thin legs. Eight pearly eyes in three groups, three eyes group in each side and two in the middle.. The abdomen is long and cylindrical. 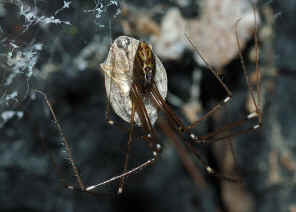 The female warps the eggs with a few stand of silk and hold in her chelicerae. It is believed that their venom is one of the most poisonous, but the fangs of these spiders are too small to cut our skin. However, this is not true. Details see below. Their venom is harmless to humans. Up to now we only found one species in this family. This page contains pictures and information about Daddy Long-leg Spiders that we found in the Brisbane area, Queensland, Australia. 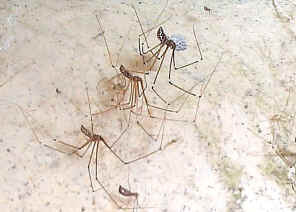 Daddy-longlegs Spiders live inside houses and buildings. 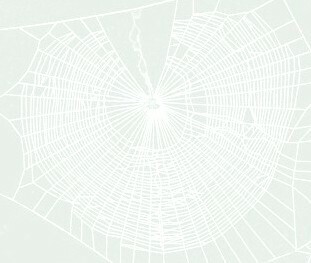 They make tangled webs in the wall corner and ceiling. 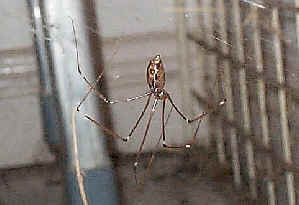 When they are disturbed, they will vibrate very quickly on their web until it can't be seen. Their body is small and legs are extremely long and thin. Their body is silver colour with brown patterns. They are easily found almost in every garage in Brisbane. 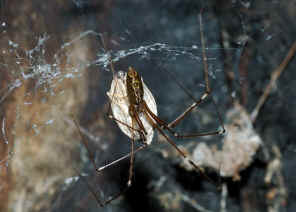 Daddy Long-Legs are the natural enemies of Red Back Spiders which are known to hunt and feed on the Red Back. 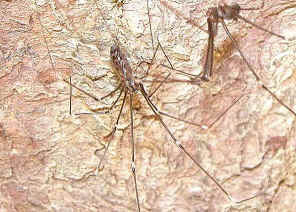 Daddy Long-Legs are quite harmless to human and they are essentially the best method to control the Red Back Spiders. 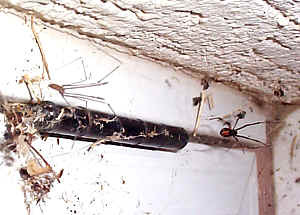 The first picture shows a Daddy Long-leg approaching an Red Back spider. This spider does not make egg-sac, instead females carry the egg mass with them wherever they go. 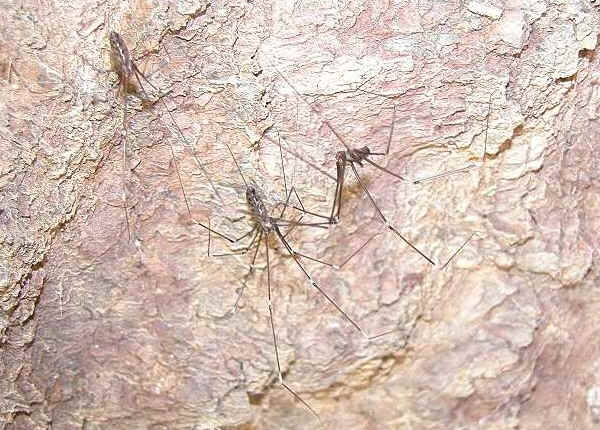 In the wild Daddy Long-legs live inside large tree holes near ground and shelters under rocks. 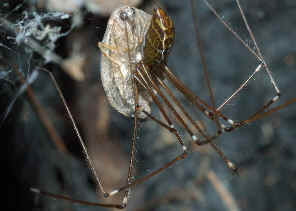 The Daddy Long-leg in the above picture is very large, up to 100mm leg to leg. It was nesting alone inside a burned tree hole. The pictures show it just capture a small lacewing. 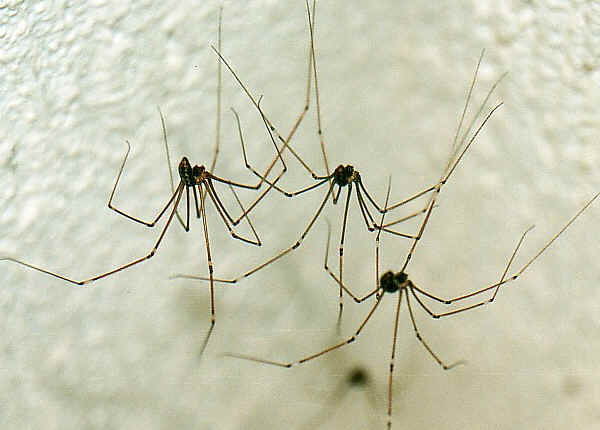 Does Daddy Longlegs' venom rank among the most highly toxic of all spiders? We read quite a number of spider books stated that Daddy Longlegs spiders' venom is one of the most poisonous, but the fangs of these spiders are too small to cut our skin, so they are not considered as dangerous spiders. However, we also read some spiders books they said that Daddy Longlegs' venom are harmless to humans. We are confused. We think the 'most poisonous' point is more interesting and it seems better to believe they are toxic than non-toxic. So we put the ''most poisonous' information in our web page....... until our visitor Justin Cordill sent us the email. 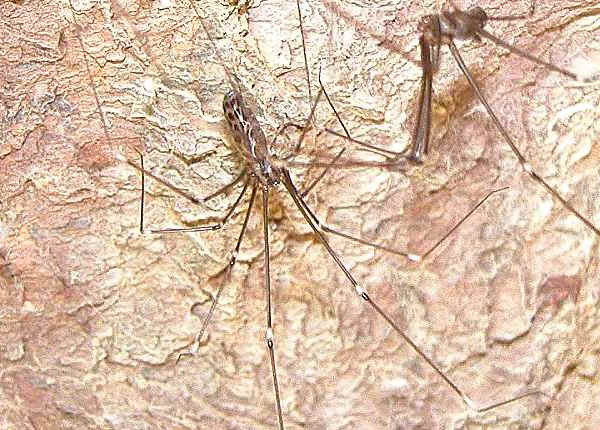 "It started out with the myth of harvestmen, Opiliones, one family called daddylonglegs allegedly having deadly venom, but they couldn't cut through the skin. In fact, Opiliones as an order does not have venom. "The next urban myth was in response to this. The cellar or daddylonglegs spiders have deadly venom, but couldn't bite through the skin. Again, totally false. "There have never been reports of problems with pholcids. Recluse spiders are much less equipped to bite through skin than pholcids are. Their chelicerae are fused, leaving only two tiny fangs to do the work, but if you kill one with the fangs in contact with the skin, I'm sure you've seen some of the results. Due to the effective treatment, the only dangerous aspect of recluse bites is if the MD does not know the treatment. "There exists a huge amount of bad information out there on arachnids, and you appeared to have picked up on a lot of it." Here we would like to thank Dr. Robert G. Breene and Justin Cordill again for their advice. 1. Wildlife of Greater Brisbane - Queensland Museum 1995, p27. 2. 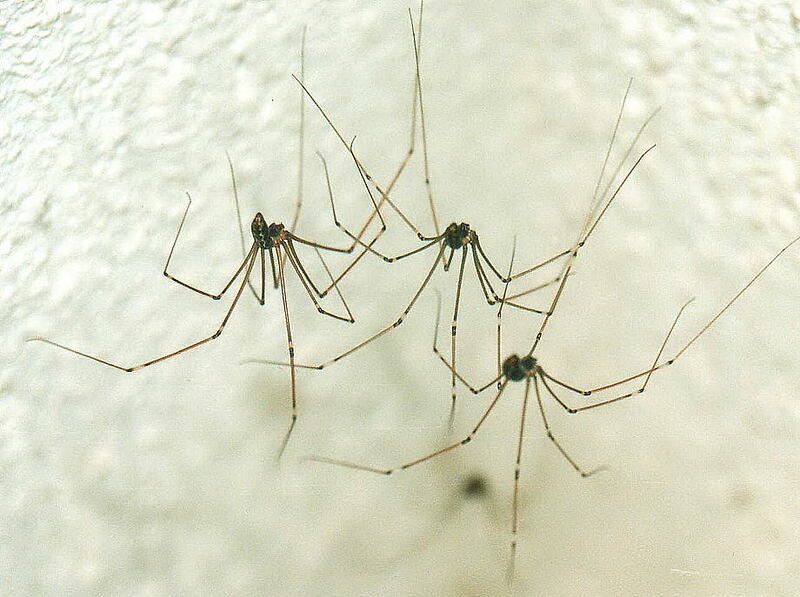 Daddy long-legs - The Find-a-spider Guide for the Spiders of Southern Queensland, Dr Ron Atkinson, 2009. Last updated: November 19, 2009.